UC IPM's new Pest Alert helps you identify Bagrada bug, an invasive stink bug spreading through western Arizona and southern California causing severe crop, nursery, and landscape losses. In agriculture, Bagrada bug is a pest of cole crops and other mustard family plants. In home gardens it feeds on these same vegetables and on ornamental plants such as sweet alyssum and candytuft. Bagrada bugs use their needlelike mouthparts to pierce and feed on plants and their seeds. Damage includes leaf spotting, wilting, stunting, multiple branches or crowns, and death of the whole plant. 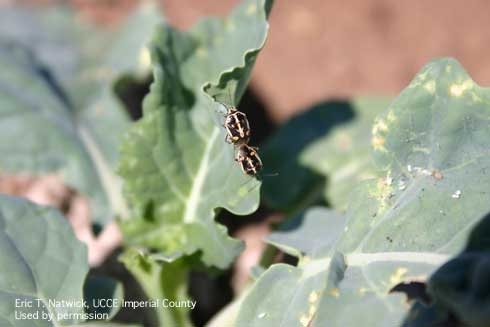 The Pest Alert was produced by UCCE advisors Eric Natwick and Surendra Dara, John Palumbo from the University of Arizona, and the UC IPM team. Preliminary agricultural management information is also available.